Developed to meet a vital need in community care worker management, this module allows seamless connection and communication between head office (Program Managers and SMS) and off site care workers by allowing access to Mobile Rosters. 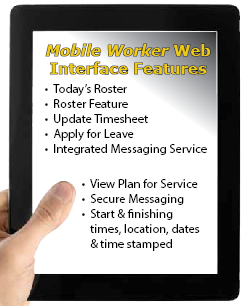 With no special hardware or app required, the SMS Mobile Worker Web Interface allows care workers to use any available internet connection to provide and receive rosters, timesheets and messages. Saving both time and money, (compared with the cost to your organisation for text messaging, faxing, devices, data plans etc. Workers can view rostered services with their attached plans as well as log start and finisht times in real time. When logging times for services GPS can be used to ensure worker is within radius of clients location before sign in/out. Options to apply for leave as well as download documents are also available. Mobile Worker Web Interface is the perfect add on module for Service Management System (SMS) Community Care Software.